“Alone if lucky, quick and quiet, with my mouth shut tight” — is how the artist, Ann Wood, would like to leave this world. If you have ever been in the company of death, there is a chance you have thought about your own exit strategy, and how most of us would like it to be painless and swift. Wood has this saying written in giant cursive script fashioned out of black pom poms affixed atop of retro floral scrapbooking paper. 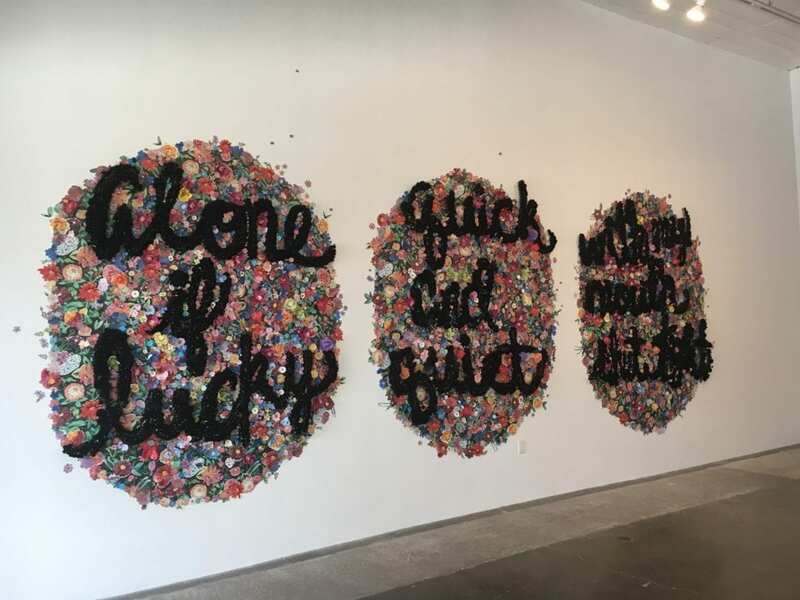 At first glance, there is something jubilant and mirthful about the installation; then it grows deceptively darker and the title How I Hope to Die registers in your mind. The way I encountered this artwork is how I encountered the entire exhibition: by first experiencing joy and then slowly fading into melancholia. A major impetus for the exhibit was the recent loss of Wood’s parents (within six weeks of each other) and her reckoning with that loss, as well as what to do with all their belongings. 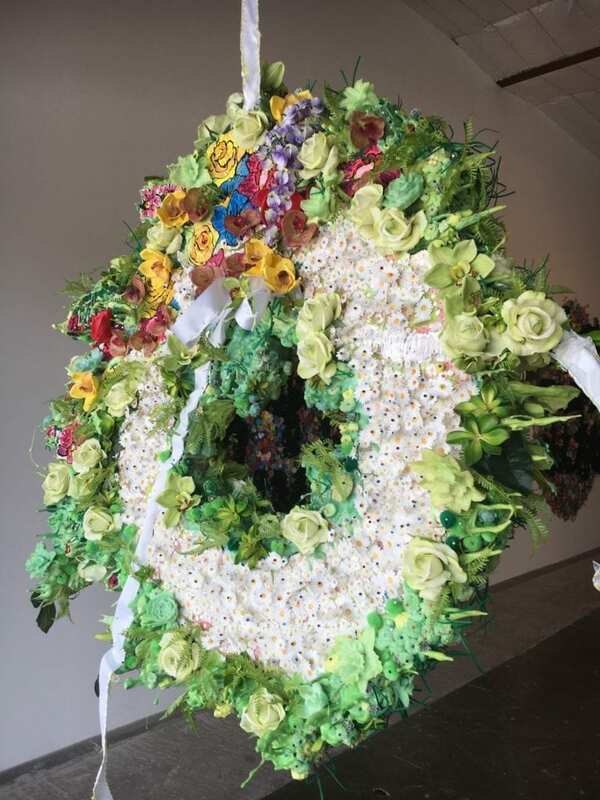 The show is arranged with various installations that I have taken to be itinerant memorials. One tableau displays a living room with a recliner, shag rug, and working electric fireplace. 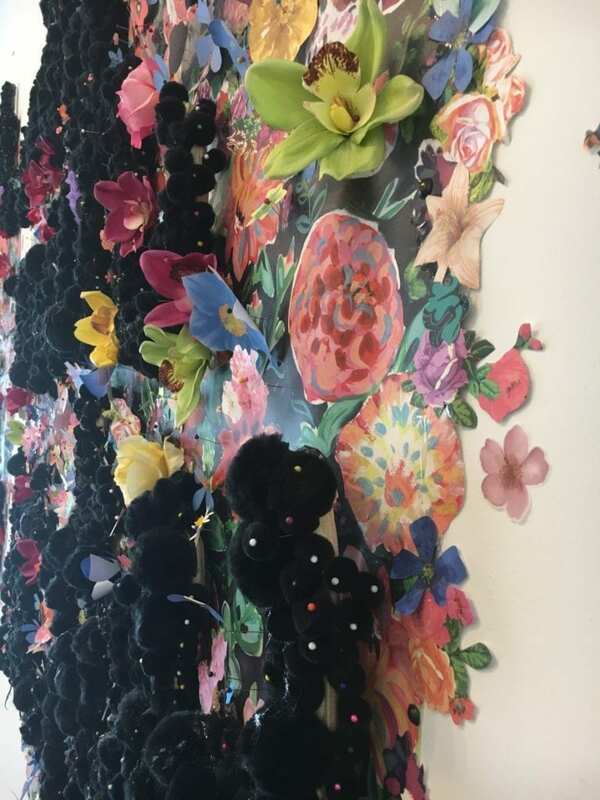 Each of these interior elements has been enveloped by the artist’s signature assemblage of colored poured plastic, artificial flowers, taxidermy and pom poms. These materials are often associated with crafting projects, but Wood lovingly imbues them with a sense of importance, memorializing the objects. 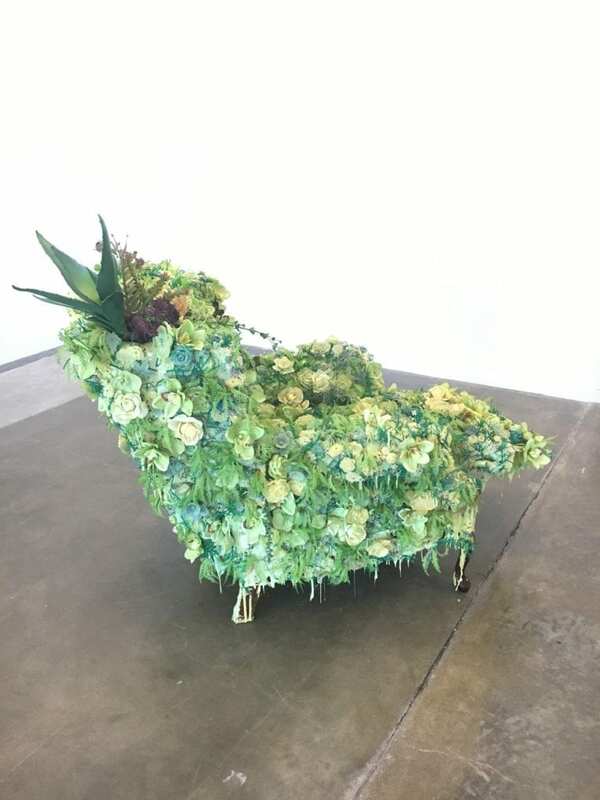 In My Father’s Deathbed, a reclining chair is smothered with fake flowers in garish shades of green, rendering it visible only by its outline. These blooms remind me of the ones commonly found at gravesites used for their durability but not necessarily for their elegance. 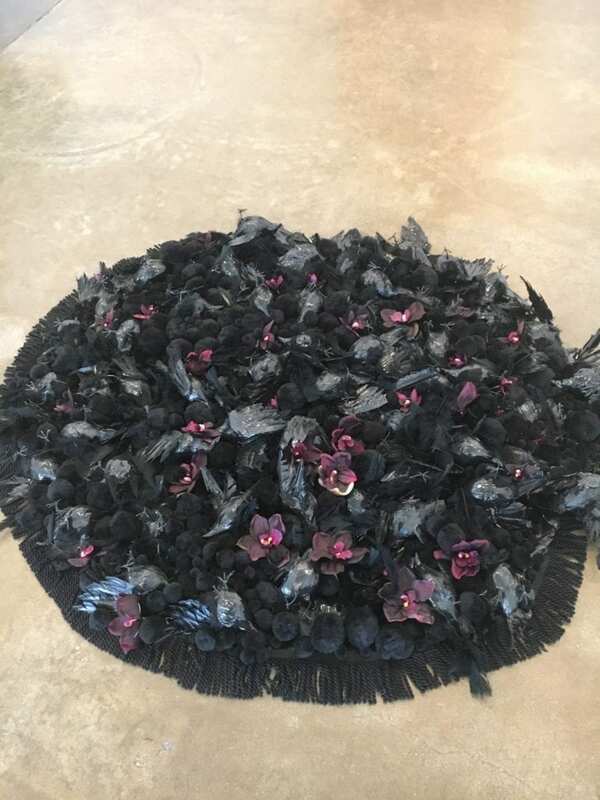 In the work entitled Pile, Wood has created a rug made of pom poms, artificial black birds, tassels and plastic flowers all in black, the color of mourning. The dead birds are campily presented in states rigor mortis with their feet in the air or their wings splayed out. 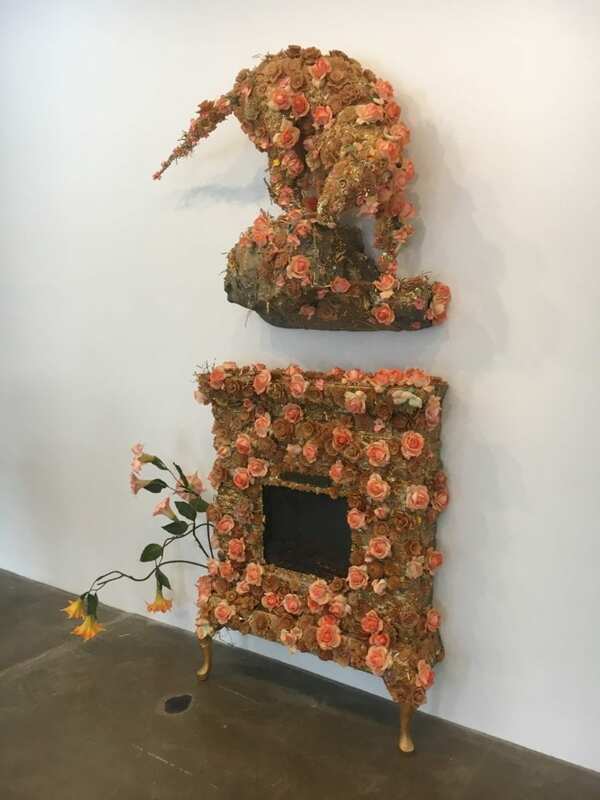 Wood excels with her use of materials and found objects, so much so that everything I surveyed in the show I instinctively wanted to touch and fondle. However, I didn’t because I know better than that, and I have some semblance of manners! 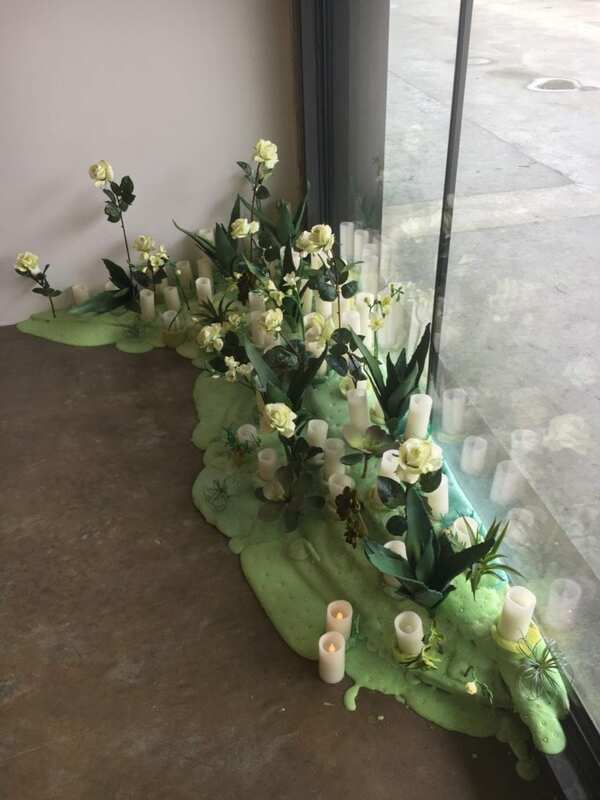 Also, the artist presents what I would like to call public displays of sympathy (PDS, for short) employing signifiers such as candles and sprays/wreaths of flowers. These PDS are often found where a tragic event has taken place, like in front of schools or churches where mass shootings have occurred. As a nation, we have become inundated with images of these scenes of flowers, candles, and teddy bears propped up against chain link fences playing on loops on our television screens. One particular work called Thoughts and Prayers reminded me of these types of unfortunate scenes that have become too horribly commonplace in our country. The installation is huddled in a corner of the gallery, and the viewer has to kneel down to see the flickering LED candles. It is eerily poignant and heartbreaking all at once. Wood harkens to the decadence of the Rococo style and to moroseness of the work of artist, Petah Coyne, but she is all her own creation. I can’t wait to see what she does next.